An image depicting successful decompression of the orbit can be seen below. This image represents the successful decompression of the orbit. The periorbital fat that encases the orbit can be seen herniating into the intranasal cavity (1). This procedure reduces the intraorbital pressure. Hippocrates noted the association of trauma just above the eyebrow and gradual vision loss. By the 18th century, the relationship between frontal trauma and vision loss with an absence of ocular injury was well appreciated. In 1879, Berlin described the first pathologic examination of the optic nerve after head trauma. In 1890, Battle first distinguished penetrating direct from nonpenetrating indirect optic nerve injuries. The 20th century saw significant progress in defining the classification, pathophysiology, and management of traumatic optic nerve injuries. Historically, the 3 treatment paradigms advocated for traumatic optic neuropathy are observation, medical corticosteroid therapy, or optic canal decompression. In the early 1900s, transcranial unroofing of the optic canal was the surgical procedure of choice for traumatic optic neuropathy treatment. This procedure was used sparingly because of the inherent risks of intracranial surgery. In the 1920s, Sewell performed a transethmoidal optic canal decompression by removing the lamina papyracea and medial wall of the optic canal. Although his technique was refined by progressive advances in transnasal, transantral, transorbital, and external paranasal sinus surgery, the technique was not performed routinely until the 1960s in Japan and the 1980s in the United States. During this period, systemic corticosteroid treatment was also extended to treatment of traumatic optic neuropathy. Craniofacial trauma patients are at significant risk for visual disturbances due to a variety of mechanisms owing to the vulnerable anatomic location and rigidity of the bony orbit. Trauma can precipitate various pathophysiological conditions that ultimately manifest as visual dysfunction. Nonneuropathic ophthalmic injuries should be excluded with a thorough ophthalmic examination, which includes orbital and cranial imaging studies. This examination should clearly delineate the nature of any neuropathic vision loss. Trauma-induced injury to the optic nerve can occur anywhere along the nerve's intraorbital-to-intracranial length. Direct traumatic optic neuropathy is the term used when the optic nerve is impinged, crushed, or transected. These injuries are usually the result of open craniofacial trauma, such as penetrating wounds (eg, from knives, BBs, pellets) or extensive crush injury with displaced cranio-orbital fractures. Indirect traumatic optic neuropathy occurs in the absence of direct optic nerve injury and is more common than direct traumatic optic neuropathy. In the United States, incidence of indirect traumatic optic neuropathy is approximately 2.5% in patients with midface trauma and 2-5% in patients with closed head injury. Internationally, incidence of indirect traumatic optic neuropathy in the Western world is reportedly 0.7-5%. Most clinical series in Western literature involve fewer than 40 patients. A higher incidence of indirect traumatic optic neuropathy is reported in some Japanese studies; however, the reason remains unclear. Traumatic optic neuropathy is most commonly caused by motor vehicle and bicycle accidents (15-75% of cases, depending on the series). Falls (15-50% of cases) are the next most common cause, followed by physical violence and recreational sports. The exact pathophysiology of traumatic optic neuropathy is poorly understood. Although optic nerve avulsion and transection, optic nerve sheath hematoma, and optic nerve impingement (from a penetrating foreign body or bony fracture) all reflect traumatic mechanisms of the optic nerve dysfunction, they are frequently considered entities independent of traumatic optic neuropathy. These less common forms of traumatic neuropathic vision loss are covered separately in Traumatic Optic Neuropathy. Traumatic optic neuropathy, in its most common form, is an indirect event that occurs during or shortly after blunt trauma to the superior orbital rim, lateral orbital rim, frontal area, or cranium. The most widely held belief maintains that compression forces from the trauma are transmitted via the orbital bones to the orbital apex and optic canal. Laser interferometry studies demonstrate that forces applied to the frontal bone are concentrated and transferred to the orbital apex and anterior foramen of the optic canal. Elastic deformation of the sphenoid then allows transfer of the force to the intracanalicular segment of the optic nerve. Contusion of the intracanalicular optic nerve axons and pial microvasculature produces localized optic nerve ischemia and edema. The edematous ischemic axons result in further neural compression within the fixed-diameter bony optic canal, precipitate a positive feedback loop, and trigger the development of an intracanalicular compartment syndrome. Although ischemia is considered the secondary event that gives rise to the neuropathy, the cellular and subcellular events that constitute the mechanism of neural damage are only now being realized. The roles of oxygen free radicals, enzymes, cytokines, intracellular calcium, and other forms of reperfusion damage are slowly being uncovered through basic science research. A less common form of traumatic optic neuropathy that involves the intracranial optic nerve results from forces delivered by the brain's shift at the moment of impact. The intracranial optic nerve is sheared as it moves against the falciform dural fold as it overlies the sphenoid plane. The rationale for medical and surgical treatment of indirect traumatic optic neuropathy stems from the belief that trauma creates a mechanical shearing on a proportion of retinal ganglion cell axons and subsequent edema of the optic nerve. This swelling within the rigid confines of a bony optic canal causes further trauma to the previously undamaged retinal ganglion cells, perpetuating the vision loss; therefore, in theory, decreasing this swelling may halt further damage and limit secondary damage to the optic nerve. The diagnosis of traumatic optic neuropathy is clinical. Patients with midfacial and cranial trauma should elicit a high index of suspicion for traumatic optic neuropathy. Although patients with traumatic optic neuropathy may have serious and obvious craniofacial, neurosurgical, and other comorbidities, they may also have no visible signs of injury. In addition, although 40-60% of patients with traumatic optic neuropathy present with a visual acuity of light perception or no light perception, nearly 20% of patients have a visual acuity of 20/200 or better. Forces required to cause traumatic optic neuropathy put the patient at risk for significant head injury and mortality. In one large Canadian study, this was as high as two thirds, and up to 14%, respectively. Features of traumatic optic neuropathy include unilateral or bilateral ocular involvement, reduced visual acuity, afferent pupillary defects, impairment of color vision, variable visual-field defects, and changes in the optic disc appearance on funduscopy. Assume optic nerve dysfunction when a loss of best-corrected visual acuity or visual field is accompanied by an ipsilateral afferent pupillary defect (eg, Marcus Gunn pupil). This, of course, is not reliable when the patient has bilateral insult. Obtain a detailed medical history and identify premorbid ocular conditions that may limit vision recovery. If the patient's clinical situation limits detailed communication, query the patient's family, paramedics, or witnesses to the trauma about the details of the injury. Ocular adnexa: Examination may reveal orbital rim and wall fractures, orbital edema, proptosis or enophthalmos, or extraocular muscle dysfunction. Signs of penetrating injuries, such as protruding foreign bodies, extruding orbital contents, or conjunctival laceration, may range from obvious to subtle. Visual acuity: Assess visual acuity immediately upon presentation. Perform a second assessment within 24 hours of the first to discern cases of delayed optic neuropathy (< 10% of traumatic optic neuropathy cases). Pupillary reaction: An afferent pupillary defect (APD) is a necessary condition for the diagnosis of traumatic optic neuropathy. Normally, light in one eye causes equal constriction of both pupils (direct and consensual pupillary light reflex). With APD, light in the affected eye causes only mild constriction of both pupils. Light in the unaffected eye causes normal constriction in both pupils. Pupillary reaction is evaluated with the swinging flashlight test (ie, briskly alternating a flashlight beam from one eye to the other). Alterating the light between each eye every 2-3 seconds, the pupil of the affected eye will dilate with direct light and constrict with light in the unaffected eye. Intraocular pressure: Increased intraocular pressure may accompany an orbital hematoma, diffuse orbital hemorrhage, orbital emphysema, or soft tissue edema. Ophthalmoscopy: Perform ophthalmoscopy with the aid of a short-acting mydriatic agent (pupillary dilation) on all stable patients. Evaluate the retinal and choroidal circulation, optic nerve head morphology, and the presence of ring-shaped hemorrhage adjacent to the optic nerve head. Medical or surgical intervention or a combination of both may be indicated for patients with indirect traumatic optic neuropathy. Indications for treatment are based on clinical judgment. Absolute indications for intervention, including optic canal decompression, have not been validated by controlled outcome studies; currently, physicians must decide on therapy for traumatic optic neuropathy without a consensus on standard of care. Since publication of the CRASH (Corticosteroid Randomisation After Significant Head injury) study,  the role of systemic corticosteroids in the treatment of traumatic optic neuropathy has become more limited, and, in selected cases of traumatic optic neuropathy, surgeons may opt to bypass the use of steroid therapy and proceed to canalicular decompression. The general anatomy of the optic nerve and its surrounding structures is outlined in Traumatic Optic Neuropathy. The features within this section emphasize specific anatomical structures the surgeon must understand to evaluate neuroimaging of the orbital apex and to perform surgical decompression of the optic canal. If the anterior face of the sphenoid sinus is oriented vertically, the optic canal is likely adjacent to the lateral wall of the sphenoid sinus. If the anterior face is tilted obliquely, the optic canal may be adjacent to either the sphenoid or posterior ethmoid cells or both. When the canal is adjacent to the posterior ethmoid cells, the cells are known as Onodi cells, which may be pneumatized up to and even around the optic canal. In up to 25% of cases, a bony dehiscence may occur along the canal; always use care when working in this anatomic region. The internal carotid artery is intimately associated with the optic nerve near the posterior foramen of the optic canal. Generally, the artery lies inferolateral to the nerve, away from the area of decompression. However, tortuosity in the carotid siphon, which brings the siphon closer to the zone of surgical decompression, can occur. Study of the carotid artery on preoperative imaging and the use of intraoperative computerized navigation assist appreciation of this anatomic variant. Within the optic canal, the ophthalmic artery courses along the inferolateral aspect of the optic nerve. The artery does not enter the nerve until both the artery and the nerve are well anterior to the orbital apex. Carefully consider this anatomic relationship when surgically fenestrating the optic nerve sheath. Always perform surgical opening of the sheath in the quadrant medial and superior to the optic nerve. Another anatomic consideration during decompression is the fused fibrous origin of the 4 rectus muscles (annulus of Zinn, Zinn ring). The optic nerve, ophthalmic artery, and fibers of the sympathetic nervous system emerge within this annulus at the anterior foramen of the optic canal. Some authorities believe that the annulus represents a nonosseous region that restricts optic nerve sheath distention and promotes optic nerve compression. Some proponents of optic canal decompression in traumatic optic neuropathy believe this annulus must be lysed in select clinical cases. Patients with traumatic optic neuropathy may experience nonocular comorbidities such as closed head injury or multiorgan trauma. Basic and advanced life support is the primary objective until the patient is stabilized. The consultation for visual system evaluation should be prompt but must be triaged among the multiple consultations and ongoing critical care needs required for the individual patient. If neurosurgical concerns prevent pupillary dilation, a comprehensive examination of the posterior sclera, choroid, ciliary body, retina, and optic nerve head may be compromised or delayed. The evaluation and treatment of traumatic optic neuropathy begins after all other life-threatening injuries have been stabilized and basic lifesaving protocols have been fulfilled. Yu-Wai-Man P. Traumatic optic neuropathy-clinical features and management issues. Taiwan J Ophthalmol. 2015 Mar 1. 5 (1):3-8. [Medline]. Wu N, Yin ZQ, Wang Y. Traumatic optic neuropathy therapy: an update of clinical and experimental studies. J Int Med Res. 2008 Sep-Oct. 36(5):883-9. [Medline]. Gupta D, Gadodia M. Transnasal Endoscopic Optic Nerve Decompression in Post Traumatic Optic Neuropathy. Indian J Otolaryngol Head Neck Surg. 2018 Mar. 70 (1):49-52. [Medline]. Xie D, Yu H, Ju J, Zhang L. The Outcome of Endoscopic Optic Nerve Decompression for Bilateral Traumatic Optic Neuropathy. J Craniofac Surg. 2017 Jun. 28 (4):1024-1026. [Medline]. Ford RL, Lee V, Xing W, Bunce C. A 2-year prospective surveillance of pediatric traumatic optic neuropathy in the United Kingdom. J AAPOS. 2012 Oct. 16(5):413-7. [Medline]. Lee V, Ford RL, Xing W, Bunce C, Foot B. Surveillance of traumatic optic neuropathy in the UK. Eye (Lond). 2010 Feb. 24(2):240-50. [Medline]. Pirouzmand F. Epidemiological trends of traumatic optic nerve injuries in the largest Canadian adult trauma center. J Craniofac Surg. 2012 Mar. 23(2):516-20. [Medline]. Yu Wai Man P, Griffiths PG. Surgery for traumatic optic neuropathy. Cochrane Database Syst Rev. 2005. (4):CD005024. [Medline]. Yu-Wai-Man P, Griffiths P. Steroids for traumatic optic neuropathy. Cochrane Database Syst Rev. 2007. (4):CD006032. [Medline]. Levin LA, Beck RW, Joseph MP, Seiff S, Kraker R. The treatment of traumatic optic neuropathy: the International Optic Nerve Trauma Study. Ophthalmology. 1999 Jul. 106(7):1268-77. [Medline]. Entezari M, Rajavi Z, Sedighi N, Daftarian N, Sanagoo M. High-dose intravenous methylprednisolone in recent traumatic optic neuropathy; a randomized double-masked placebo-controlled clinical trial. Graefes Arch Clin Exp Ophthalmol. 2007 Sep. 245(9):1267-71. [Medline]. Edwards P, Arango M, Balica L, Cottingham R, El-Sayed H, Farrell B, et al. Final results of MRC CRASH, a randomised placebo-controlled trial of intravenous corticosteroid in adults with head injury-outcomes at 6 months. Lancet. 2005 Jun 4-10. 365(9475):1957-9. [Medline]. Kountakis SE, Maillard AA, El-Harazi SM, Longhini L, Urso RG. Endoscopic optic nerve decompression for traumatic blindness. Otolaryngol Head Neck Surg. 2000 Jul. 123(1 Pt 1):34-7. [Medline]. Yang QT, Fan YP, Zou Y, Kang Z, Hu B, Liu X, et al. Evaluation of traumatic optic neuropathy in patients with optic canal fracture using diffusion tensor magnetic resonance imaging: a preliminary report. ORL J Otorhinolaryngol Relat Spec. 2011. 73(6):301-7. [Medline]. Li J, Shi W, Li M, et al. Time-dependent diffusion tensor changes of optic nerve in patients with indirect traumatic optic neuropathy. Acta Radiol. 2013 Oct 6. [Medline]. Holmes MD, Sires BS. Flash visual evoked potentials predict visual outcome in traumatic optic neuropathy. Ophthal Plast Reconstr Surg. 2004 Sep. 20(5):342-6. [Medline]. Steinsapir KD. Treatment of traumatic optic neuropathy with high-dose corticosteroid. J Neuroophthalmol. 2006 Mar. 26(1):65-7. [Medline]. Ropposch T, Steger B, Meço C, Emesz M, Reitsamer H, Rasp G, et al. The effect of steroids in combination with optic nerve decompression surgery in traumatic optic neuropathy. Laryngoscope. 2013 May. 123(5):1082-6. [Medline]. Yu-Wai-Man P, Griffiths PG. Steroids for traumatic optic neuropathy. Cochrane Database Syst Rev. 2013 Jun 17. 6:CD006032. [Medline]. Yu-Wai-Man P, Griffiths PG. Surgery for traumatic optic neuropathy. Cochrane Database Syst Rev. 2013 Jun 18. 6:CD005024. [Medline]. Kong DS, Shin HJ, Kim HY, Chung SK, Nam DH, Lee JI, et al. Endoscopic optic canal decompression for compressive optic neuropathy. J Clin Neurosci. 2011 Nov. 18(11):1541-5. [Medline]. Peng A, Li Y, Hu P, Wang Q. Endoscopic optic nerve decompression for traumatic optic neuropathy in children. Int J Pediatr Otorhinolaryngol. 2011 Aug. 75(8):992-8. [Medline]. Yang QT, Zhang GH, Liu X, Ye J, Li Y. The therapeutic efficacy of endoscopic optic nerve decompression and its effects on the prognoses of 96 cases of traumatic optic neuropathy. J Trauma Acute Care Surg. 2012 May. 72(5):1350-5. [Medline]. Chen F, Zuo K, Feng S, et al. A modified surgical procedure for endoscopic optic nerve decompression for the treatment of traumatic optic neuropathy. N Am J Med Sci. 2014 Jun. 6 (6):270-3. [Medline]. Emanuelli E, Bignami M, Digilio E, Fusetti S, Volo T, Castelnuovo P. Post-traumatic optic neuropathy: our surgical and medical protocol. Eur Arch Otorhinolaryngol. 2015 Nov. 272 (11):3301-9. [Medline]. Onofrey CB, Tse DT, Johnson TE, Neff AG, Dubovy S, Buck BE, et al. Optic canal decompression: a cadaveric study of the effects of surgery. Ophthal Plast Reconstr Surg. 2007 Jul-Aug. 23(4):261-6. [Medline]. Levin LA, Joseph MP, Rizzo JF 3rd, Lessell S. Optic canal decompression in indirect optic nerve trauma. Ophthalmology. 1994 Mar. 101(3):566-9. [Medline]. Cook MW, Levin LA, Joseph MP, Pinczower EF. Traumatic optic neuropathy. A meta-analysis. Arch Otolaryngol Head Neck Surg. 1996 Apr. 122(4):389-92. [Medline]. Ahmad S, Fatteh N, El-Sherbiny NM, et al. Potential role of A2A adenosine receptor in traumatic optic neuropathy. J Neuroimmunol. 2013 Nov 15. 264(1-2):54-64. [Medline]. Henrich-Noack P, Voigt N, Prilloff S, Fedorov A, Sabel BA. Transcorneal electrical stimulation alters morphology and survival of retinal ganglion cells after optic nerve damage. Neurosci Lett. 2013 May 24. 543:1-6. [Medline]. Jacobs SM, Van Stavern GP. Neuro-ophthalmic deficits after head trauma. Curr Neurol Neurosci Rep. 2013 Nov. 13(11):389. [Medline]. Manjunath YC. Traumatic Optic Nerve Compression. Radiodiagnosis-Imaging is Interesting-Amazing Cases. Available at http://manju-imagingxpert.blogspot.com/2011/09/traumatic-optic-nerve-compression-ct.html. Accessed: October 15, 2013. Pletcher SD, Sindwani R, Metson R. Endoscopic orbital and optic nerve decompression. Otolaryngol Clin North Am. 2006 Oct. 39(5):943-58, vi. [Medline]. Roberts I, Yates D, Sandercock P, et al. Effect of intravenous corticosteroids on death within 14 days in 10008 adults with clinically significant head injury (MRC CRASH trial): randomised placebo-controlled trial. Lancet. 2004 Oct 9-15. 364(9442):1321-8. [Medline]. Endoscopic view of the intranasal anatomy: (1) lateral nasal wall, (2) middle turbinate, and (3) nasal septum. 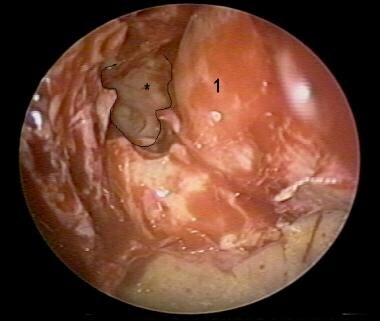 Endoscopic view after intranasal ethmoidectomy. The ethmoid air cells have been removed, exposing the orbit. The black line delineates an intact orbit prior to decompression. The first step in orbital decompression is depicted in this endoscopic view of the right eye. A curette can be observed. The surgeon is removing the thin bone covering the orbit (the lamina papyracea of the right orbit). This image depicts exposure of the orbital contents as the lamina papyracea is removed. The arrow points to the orbit without its bony coverage. The next step in orbital decompression is depicted. After the lamina papyracea is removed, a sickle knife is used to incise the orbital periosteum to allow the orbit to herniate into the sinuses, thus reducing orbital pressure. The black line highlights the limits of the orbit.